Gabriel Bolivar ’13 (Health Administration) is the patient care experience manager for the Southern California Permanente Medical Group. As part of his job, he speaks to hundreds of people per day and every other Monday he teaches orientation for new hires for 2 1/2 hours. Public speaking is natural and easy for him at this point. But on Sunday night, Sept. 24, it became momentarily difficult for him. Standing in front of a podium at the Northridge Center giving his acceptance speech in front of a room of nearly 200 people at the annual CSUN Alumni Scholarship Recognition Dinner, he stopped. Bolivar looked down and patted his chest as if to collect himself. He choked up and held back tears. 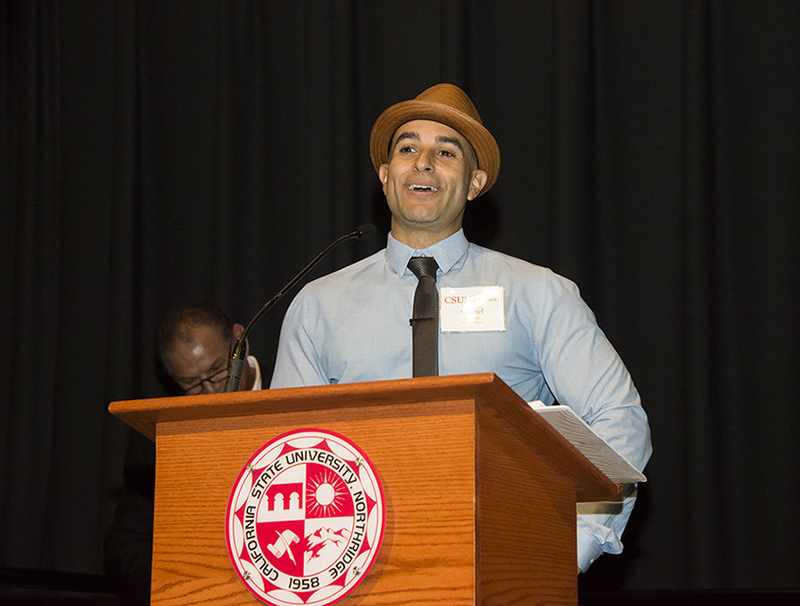 Bolivar was one of eight Matadors who received one of the Alumni Association’s First-Generation Scholarships, an award the graduate student also received in 2012 when he was an undergraduate at CSUN. “You changed my life and you changed my wife’s life,” Bolivar recalled the first time he received a scholarship. With his first award, Bolivar said he was able to conduct research with CSUN Health Administration professor Stephan Chung and create a tool that educates Mexican-American families about the uses and benefits of hospice services. That tool has now become a program utilized by five community organizations. The scholarship also allowed Bolivar and his wife, CSUN alumna Cynthia Bolivar ’17 (Family and Consumer Sciences), much needed financial comfort. “And so, your contributions are not only impacting my life, my wife’s life, but also these families who are now learning about the wonderful use of hospice within their communities,” Bolivar said. And now, with another scholarship, his path to receiving a master’s degree is smoothed and his intent to impact more people is closer to reality. The CSUN Alumni Scholarship Recognition Dinner was a celebration of 14 students who received scholarships in one of three categories — First Generation (students who are the first in their family to attend college), Legacy (students who had a parent or grandparent graduate from CSUN) and Graduate (for a student currently in a CSUN master’s program). The event was so inspiring last year that it drove new CSUN Alumni Association President and alumna Cindy Chernow ’78 (Anthropology), ’91 (Counseling and Guidance) to take on the position. “Being a part of last year’s event for the first time and hearing our student recipients left me incredibly proud to be a member of the Matador family,” Chernow said. “In fact, it was what inspired me to accept the challenge of the presidency, to help ensure continued support for the next generation of Matadors. 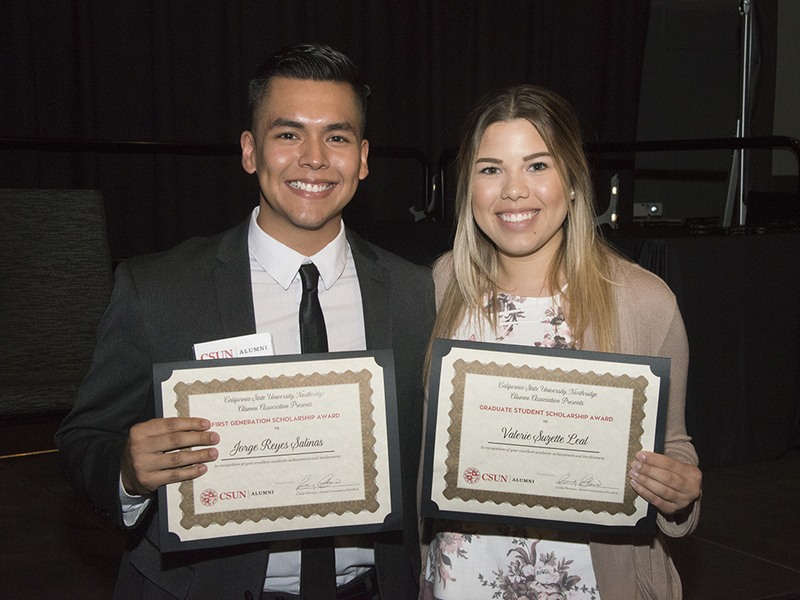 The thread that spread throughout the CSUN Alumni Scholarship Recognition Dinner was how donors weren’t just impacting one person — they were impacting many, and in some cases generations. For the first-generation recipients, scholarships are helping to fulfill the dreams of families and setting into motion a culture for future generations to seek higher education. For the Legacy Scholarship recipients, they are continuing a culture of higher education at this university and further validating the prestige of a degree from CSUN. Julie Leach, a First-Generation recipient, went to the University of Wisconsin at Madison on a track and field scholarship. However, mental illness — which she said has affected other members of her family — derailed her on her journey toward a degree. She decided to get on a new path and transfer to CSUN, where she earned her bachelor’s degree in Psychology in 2016 and is now on track to receive her master’s in social work. 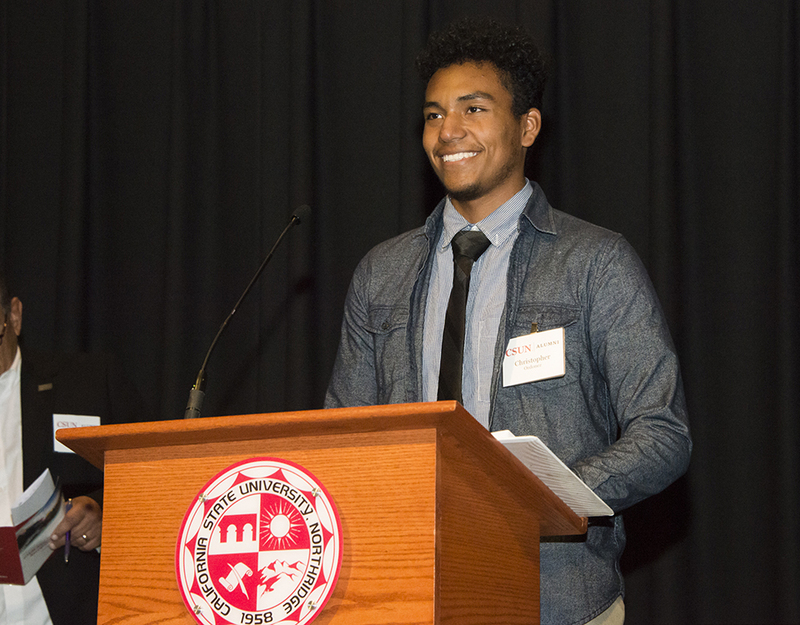 One of the most emotional moments of the night came when freshman Christopher Ordoñez gave his acceptance speech. He spoke of how he came to the United States four years ago after a life-threatening moment in his life. “The reason why I came here is because I got shot four times,” Ordoñez began. “I don’t even know how I’m here talking to you. I have one bullet in my shoulder, two bullets in my neck. I was not going to be able to talk. The doctor told me I would have to use something in my lungs to breathe. But none of that happened. It’s a miracle I’m here with you guys. Now he has even more opportunity, thanks to many of the people in the audience that night who have given to CSUN and the ones who might not even realize the impact they have made on students. A portion of each Alumni Association membership helps fund these scholarships.